Helen Marcus was born in New York on September 30th 1922. She was married to the love of her life Jim Marcus for 50 years and together they shared a lifetime of happiness. Upon their arrival in Los Angeles in the early 80’s together with business partners and friends Al Deitsch, Lyle and Andrew Thomson, they formed CHI, supplying custom carpet to the hospitable industry. They enjoyed a thriving business for many years until the passing of Jim Marcus. In 1996, she founded Zenith International. In 2000, Jan Baron-Shames joined the company as a sales representative and, in 2008, became a partner growing the business to one of the top rug manufacturers in the hospitality industry. Helen was part of the founding chapter of NEWH. She served as part of the Public Relations team in 1986 and headed up the Publications in 1987-1989 and 1995. In 1989 she was elected Executive Vice President and President in 1990. Helen was also heavily involved with the Community Service program from 2002 and Programming in 2005. Helen was honored with the prestigious NEWH Woman of the Year awarded in 1992. In addition, she helped to create and edit the NEWH News Letter and Cookbook. She also traveled to a number of cities to help charter new NEWH chapters. Helen was a trail blazer and throughout her career Helen was dedicated to empowering all women in the Hospitality industry. 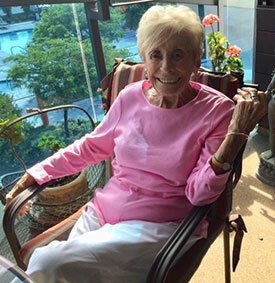 Above all, she had love and zest for life and loved to entertain, often inviting clients to the Hollywood Bowl, theater outings, intimate dinner parties and how could anyone forget the famous and anticipated annual Oscar Parties at her beautiful home in Marina Del Rey. She mentored and inspired so many in our community over the years and was loved by all that had the fortune of knowing her. Her love of our industry and her legacy will live on. I met her at my first Network of Executive Women in Hospitality (later renamed NEWH) meeting in 1991. Excited and eager to learn about this called NETWORKING, I was invited by Shelia Lohmiller to attend. She arranged the trip details and introductions to a cadre of dynamic and intriguing executive women doing business in all aspects of the hospitality industry. Yes, it was there that I first met Helen Marcus. The second time that I met Helen was November 5, 1992. I picked her up at the airport whereupon she dashed off the jet in sweats and a full length mink coat. Within seconds, she re-emerged to go on by car with me to the Key Bridge Marriott Hotel to charter our young NEWH = Washington Chapter of Network of Executive Women in Hospitality. Dressed smartly she was in quintessential “designer black” ready to take the stage with Elsie Dahlin, NEWH President. Honored I was join them the next morning for breakfast and to, again, hear her words of encouragement and guidance in to a world, at that time, still very much “male influenced”. Learning we all were and remain. Sending grateful thoughts of Helen to family and friends. She took me under her wing since those days and always inquired how she could help me. Her quick wit and broad smile, I will never forget. Helen Marcus “working the room” will never be surpassed. Her firm and friendly handshake met every hand in every NEWH gathering. Rest in peace Helen. Remarkable lady you are! Hello Lynda, thank you for sharing your wonderful memories of Auntie Helen. You are right, no one could work a room like her leaving an indelible impression on all who had the pleasure of meeting her. A true powerhouse!